If you’ve ever driven a small, fast car, you know how much fun they can be: low-slung, with a high and whining exhaust note and quick steering that will take you back to your days as a kid at the go-kart track. That, in a nutshell, is what makes the 2019 Fiat 500 Abarth and the 2019 Fiat 124 Fiat Abarth so much fun. Named after the legendary Fiat racing driver Karl Abarth and bearing iconic Abarth Scorpion badging, the specially-tuned Fiat Abarth cars are the highest-performance Fiat cars sold to the public, with exterior design, interiors, engines and suspension systems all massaged to go fast, based on Fiat’s hard-won knowledge from the track. Ready to buy a 2019 Fiat Abarth in Fayetteville, Arkansas? Now you’re talking! If so, stop in soon at McLarty Daniel Chrysler Dodge Jeep Ram Fiat of Springdale, Northwest Arkansas’s only Fiat dealer! You can also check out our great selection of FIat models online right now! 2019 FIAT 500 ABARTH: Ten pounds of blasting power in a five pound bag, the 2019 Fiat 500 Abarth may be small, but what it lacks in size, it makes up for with aggressive styling, sizzling performance and a fun factor that just won’t quit. Competitively raced the world over, Fiat 500 Abarth cars have been heavily breathed on by the race teams at Fiat to create a car that can hang with the big boys. 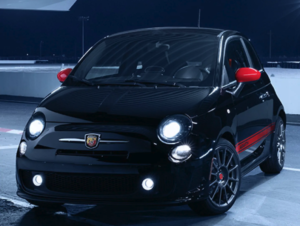 The exterior of the 2019 Fiat 500 Abarth is best described as sinister: blacked out with red accents, an Abarth-tuned dual exhaust, red brake calipers, 16-inch forged Hyper Black alloy wheels, and a red Abarth stripe. Inside, the interior bleeds Abarth red as well, with highback two-tone buckets, an available BeatsAudio premium sound system, and an Abarth-only flat-bottomed racing steering wheel. Under the hood, the 1.5-liter MultiAir Turbo Engine produces sweet music, pumping out 160 horsepower and 170 lb.-ft. of torque. 2019 FIAT 124 SPIDER ABARTH: Ever dreamed of owning a beautiful, spirited, fun-to-drive Italian roadster, but thought you never would? Now you can on most any budget, with the 2019 Fiat 124 Spider Abarth! Building on the curvaceous, aggressive, heritage-inspired styling of the Fiat 124 Spider, the 2019 Fiat 124 Spider Abarth ups the ante and the attitude with a car that makes plentiful nods to Fiat’s proud racing history. Available in either a riotous red with black accents, or a classic white with flat black hood, the 2019 Fiat 124 Spider Abarth delivers a pulse-quickening 164 horsepower and 184 lb.-ft. of torque to the rear wheels, thanks to the intercooled turbo four cylinder backed by a six-speed manual transmission with a short-throw shifter, for an exhilarating drive in such a light and nimble car. Abarth-exclusive 17-inch aluminum wheels in Gun Metallic with put the power to the ground, matching the contrast-painted mirror caps, roll bars and windshield surround. Heard enough to know you’re ready to buy a 2019 Fiat 500 Abarth or 2019 Fiat 124 Spider Abarth in Fayetteville? Then you’re ready to come see us at McLarty Daniel CDJR-Fiat in Springdale. We’re the area’s only Fiat dealer, and we’ve got the hook up! Stop in today for a test drive, or check out our big selection of new Fiat vehicles online right now!